Read what Enough's experts are saying about the surrender of top LRA commander Dominic Ongwen, the backstory of the fighter known as "The White Ant," and news coverage from outlets ranging from The New York Times to Vice News. UPDATE: State Department officials have confirmed that Dominic Ongwen will be transferred to the African Union Regional Task Force. Two key governments of the AURTF, Uganda and the Central African Republic, have committed to transfer Ongwen to the International Criminal Court (ICC), according to the U.S. State Department. Based on the ICC's 2005 arrest warrant, Ongwen faces seven counts of war crimes and crimes against humanity, including murder, enslavement, and pillage. New York Times: "Fighter defects, citing ties to the fugitive African Warlord Joseph Kony"
TIME Magazine: "One of Joseph Kony's Top Commanders Just Surrendered to U.S./African Union"
Voice of America: "Surrender of LRA Commander Seen as Step Toward Justice"
Vice News: "Ugandan Forces Confirm Lord's Resistance Army Commander Has Surrendered"
CCTV Africa [Video]: "Rebel Commander Surrender a Sign LRA in Dire Straits"
Kony to LRA: "Bring me ivory, gold, and diamonds"
Sasha Lezhnev, Associate Director of Policy for Congo, the Great Lakes Region, and the LRA at the Enough Project, said: "Ongwen's defection is strong evidence that the African mission against the LRA is working, slowly but surely. It will have a major psychological impact on other LRA commanders. But this is not the end — the U.S. and European Union must deepen the mission to counter the LRA's illicit trafficking networks in ivory, diamonds, and gold, or else a revitalized LRA could come back in 2015." Holly Dranginis, Enough Project Policy Analyst, said: "Ongwen's surrender not only signals a breakdown among LRA leadership, it triggers a critical opportunity for justice. Ongwen is indicted for murdering civilians, enslaving children, and stealing property. At a time when some are questioning the ICC's credibility in the central African region, Ongwen's surrender gives the court a chance to show its power to end impunity for atrocities, and help restore dignity to victims of the LRA's brutal crimes." 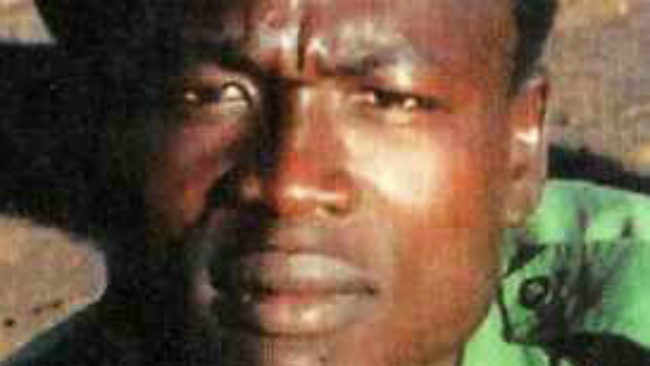 Background information on Ongwen is provided in part by the LRA Crisis Tracker, by Enough Project partner organizations Resolve and Invisible Children. On January 6th, 2015, top LRA commander Dominic Ongwen surrendered to American forces in the Central African Republic (CAR). His identify was confirmed by the Uganda People’s Defense Forces (UPDF). This is a seminal moment in the counter-LRA mission and a blow to the LRA overall. Out of the original five commanders indicted by the International Criminal Court (ICC), two have been reported killed in action, one was executed by members of the LRA, and Joseph Kony, their leader and commander remains in hiding. With the loss of Ongwen, there is stronger evidence that the mission against the LRA is working. Ongwen was an active combatant and top tier general, allegedly leading assaults in Uganda in 2002 and 2003 that led to the deaths of over 2,000 people and the abduction of 3,000 more. In 2005, Ongwen was charged with seven counts of war crimes and crimes against humanity by the ICC, making him the youngest person ever indicted by the ICC for crimes against humanity. He is also the only person to be charged with a crime he himself has had committed against him. About fifteen years after Ongwen was abducted by LRA forces while walking to school in northern Uganda, he himself was indicted by the ICC on charges including enslavement. Dominic Ongwen was taken under the wing of Vincent Otti (allegedly executed by Joseph Kony for treason in 2007), and received accolades and promotions from the LRA commander. By his late 20s, he had become a brigadier general – one of the LRA’s top ranks, putting him in Kony’s circle of advisors and taking charge of vast swathes of geography and atrocity. But Ongwen’s time in the spotlight had a limit, and when his mentor was executed, he became one of Kony’s most outspoken critics, publicly defying him despite remaining with the army. As Kony’s ranks began to crumble in recent years, reports emerged that Ongwen had returned to power within LRA ranks in 2013, but public sightings and reports have been scarce – until this week. Enough and other human rights groups have called for Ongwen's transfer to the ICC.